13 ½” X 19” serigraph print--contemporary design. 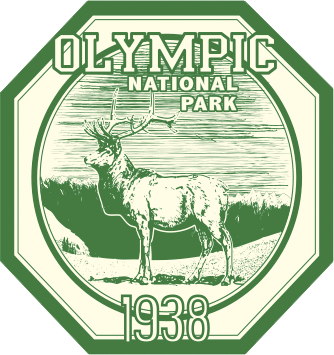 Olympic National Park was created as a forest preserve by Grover Cleveland in 1897. 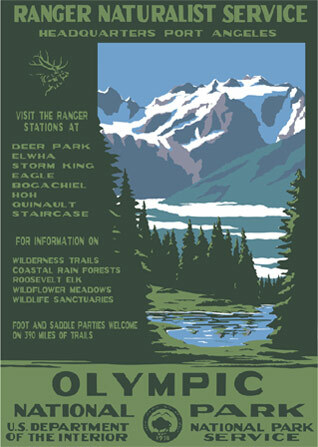 It was a favorite of Teddy Roosevelt (the elk there are named after him) however, it was FDR who created national park status in 1938--the year this poster series were first printed. However Olympic was not among them. This contemporary design tries to capture both the majestic scope of the Hoh Rain Forest and towering Mt. Olympus above.